The complex composition of aqueous environmental sample matrices, especially sewage and marine water samples, and the low concentrations in which the surfactants are generally found, have made it necessary to perform an initial stage of concentration and purification of the analytes prior to its analysis. Traditionally, such steps were carried out off-line with procedures based on liquid-liquid extraction (LLE), sublation or steam distillation, followed by chromatographic clean-up steps. (NP) and nonylphenol ethoxylates (NPEOs),  for alcohol ethoxylates (AEs), and  for linear alkylbenzene sulfonates (LASs) and sulfopheny carboxylates (SPCs)). The present chapter provides an overview of methods currently used for extracting and concentrating surfactants from aqueous matrices. Some of the techniques will be addressed only briefly, because they are discussed elsewhere in this book more extensively. Due to the physico-chemical properties of surfactants, it is difficult to obtain samples that are fully representative of sampling sites . The intrinsic nature of surfactants results in them tending to concentrate or adsorb at interfaces, and this affects not only the way they disperse, but also in which environmental compartments they accumulate. This means that the vertical distribution of surfactants is not homogeneous and depends on the degree of physical mixing occurring in the water column. 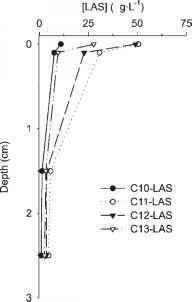 For example, in the case of the distribution of an anionic surfactant in the marine medium (in a stagnant zone), the highest concentrations of LAS homologues were detected in the surface microlayer (around one order of magnitude greater than that found at depths of more than 20 cm) [7-9]. Figure 3.1.1 shows a typical vertical profile of a surfactant-type molecule. Accumulation of surfactants in the surface microlayer may also occur locally during sampling as a result of sampling vessel discharges. 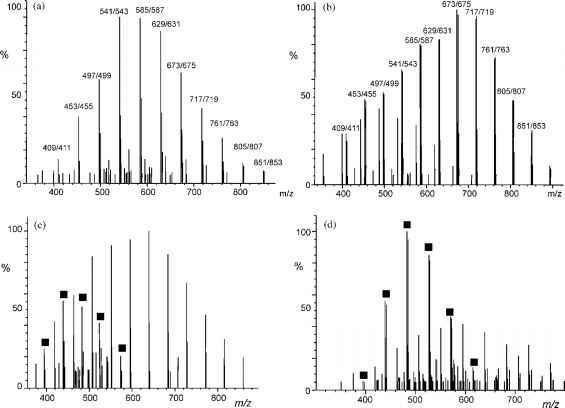 High concentrations of alkylphenol ethoxylates (APEO) in seawater sampled with buckets were observed when compared with a submerged (depth 2 m) automatic torpedo sampler . The oligomer profile observed in the high level samples corresponded to that of bilge and wastewater discharged by the ship. Consequently, for an accurate quantification of surfactants in the water column, sampling must be performed by taking surface micro-layer samples (at depths between 0 and 3 -5 mm), using a surface sampler, and at various greater depths with Ruttner or similar bottles. Fig. 3.1.1. Vertical profile of LAS homologues in the water column in the Besaya Estuary (north of the Iberian Peninsula, Spain) (Figure taken from Ref. ). As for the many surfactant metabolites, their distribution is often more homogeneous due to the loss of surfactant properties by the molecules. This would render the sampling procedure much simpler. Also, for an accurate quantification in the water column, it must be ensured that an effective desorption of the surfactants in the suspended solids is performed, before or during the pretreatment of the samples. The suspended solids fraction can significantly contribute to the total concentrations of surfactants in the water sampled, depending on the suspended matter concentration in the water. de Voogt et al. showed that in wastewater treatment plant (WWTP) influents, suspended solids can contribute up to 50% of the total NP, and 20% of the total NPEO concentration in the water, respectively. Di Corcia et al. proposed that a specific volume of methanol should be added to the sample before the extraction stage to encourage the desorption of the surfactants. Another procedure they suggested is to filter the sample and analyse the LAS in two phases. However, e.g. marine waters, this involves processing large volumes of water to obtain a sufficient quantity of solids from which to extract the surfactant and the risk of contamination would thus be greater. In order to avoid further biodegradation of surfactants after sampling or during storage, various substances have been used for the preservation of samples. So far, mainly formaldehyde and salts of copper(II) and mercury(II) [7,14] have been applied, and formaldehyde has been found to be the most effective of these, although still not sufficient for long term storage. This topic is discussed in more detail in Chapter 4.3. Another aspect to take into account is that surfactants are often ingredients in the cleaning products used in chemical laboratories. The sampling (as discussed above) and sample handling to which the samples are subjected always carries with it the risk of contamination. It is therefore necessary to process sufficient numbers of blank samples together with the real samples. Numerous samples of oceanic seawater and fossil seawater (taken from wells) have shown traces of LAS (around 1 ppb). Therefore, environmental concentrations found at similar levels should be regarded with caution. Prior to the quantitative determination of surfactants from aqueous environmental samples, a preconcentration step is needed to enrich low amounts of target analytes and to remove interfering matrix components. The extraction of an anionic surfactant from river water has been performed by ion-pair LLE with the methylene blue cation [15-17]; a recovery in river water of 96.7% and a detection limit of 0.05 mg L-1 have been reported. The solvent sublation procedure of Wickbold  is another method that has been used for the analysis of LAS present in seawater [19,20]. The solvent sublation technique (gaseous stripping into organic solvent, often ethyl acetate) has also been used to isolate and concentrate non-ionic surfactants, e.g. AEs and APEO in aqueous samples [21,22]. The co-extracted interferences can be eliminated by cation/anion ionexchange and alumina chromatography [23,24]. For samples of diverse origins, such as river water and sediment, raw and treated municipal wastewater and activated and digested sewage sludge, a simultaneous distillation and solvent extraction has been employed to isolate the NP, NPEOi and NPEO2 . Recoveries were higher than 80% and the estimated detection limit in water samples was 0.5 mg L-1. For APEOn (n $ 3) the solvent sublation technique was used . For the determination of NPEO in liquid cleaning products, the analytes were batch-extracted by stirring with hexane-acetone (75:25) . For the quantification of non-ionic surfactants (AE) in raw and settled influent and effluent of municipal sewage treatment plants, the separate extraction of liquid and solid phases and chromatographic clean-up have been performed . For the liquid phase, solvent sublation was chosen since it enables large volumes of sample to be used. Analytical recoveries of standard additions were > 80%. The detection limit of the procedure for effluent samples was 3.0 mg L-1. With the aim of minimising the time taken in the preconcentration, and extending the chemical analysis of surfactants to more complex aqueous matrices in which very low detection limits are required, preconcentration techniques using solid-liquid extraction with various adsorbent materials, such as XAD  and anionic exchange resin  have been developed. Nowadays, SPE has been shown to be a very powerful and robust alternative to the traditional extraction methods stated above [29,30]. It offers the advantages of very low solvent consumption, speed, and ease of handling, and combines the concentration and (partial) clean-up into one on-line step. Various types of commercially available stationary phases enable the application of distinct separation mechanisms, thereby increasing the selectivity of the adsorbent to the analytes. To date, typical SPE materials are based on silica gel or highly cross-linked styrene-divinylbenzene (PS-DVB). The former is functionalised with distinct chemical groups to yield various sorbents with non-polar or polar characteristics. Non-polar materials are modified with alkyl groups of different chain length (C18, C8, C2), while polar sorbents have cyano-, amino-, or diol-bonded groups. Ion-exchange phases have either anionic or cationic functional groups. Up to now C18 and C8 phases have been most frequently employed [25,31-34]. However, both phases have a high retention power and therefore a great many substances may interfere in the analysis. In these cases it is necessary to use a second cartridge as a clean-up stage. The hydrophobic and ionic nature of the surfactant molecule has consolidated the use of minicolumns of the hydrophobic (C18, C8, C2) and strong anionic exchange (SAX) types [6,7,25,35-38]. Minicolumns that act as both reverse and anionic exchange phases at the same time, such as that of graphitised carbon black (GCB), have also been employed. The applications have been very diverse, taking into account the many different matrices studied (Table 3.1.1; [39-42]). The main drawback of all silica-based materials arises from their limited pH stability. Reversed-phase (RP) polymeric sorbents such as PS-DVB offer several advantages: this material can be used under extreme pH conditions, has higher specific surface areas and shows greater retention for polar compounds. Chemical modification of the polymeric resin yields highly selective stationary SPE phases . Another alternative sorbent is non-porous GCB with positively charged active centres on the surface, which offers the singular feature of behaving as a non-specific RP sorbent and anion exchanger . By exploiting this feature, the separation of acidic compounds from co-extracted base/neutral ones can be easily achieved by differential elution. In Table 3.1.1, a selection of analytical methods is compiled, which are based on SPE for the preconcentration of a range of surfactant classes from wastewater, surface, and drinking water samples. Verification of the proper choice of the enrichment method can be done through recovery studies under varying conditions of the most important parameters, such as amount and quality of the enrichment material, pH of the sample, as well as the amount and quality of analyte and matrix to be enriched. These parameters not only differ based on the chemical behaviour of the analyte, but are also strongly dependent on the matrix to be analysed. Quite often the most crucial parameter for SPE of compounds for which no enrichment techniques for environmental samples can be found in the literature is the selection of the proper SPE material. For example, during extraction of the two non-ionic surfactants, alkyl glucamides (AGs) and alkyl polyglucosides (APGs) from a spiked WWTP effluent (5 mgL-1) using RP-C18 cartridges, it was found that this material was unsuitable for quantitative enrichment (recovery < 30%). Satisfactory results were obtained using PS-DVB material (Lichrolut EN)  (Table 3.1.2).